Oh my God, I love this book so much. More positivity! This is THE BEST X-book out there right now, and it’s a shame if you’re an X-fan who’s not reading it. Mike Carey has very carefully crafted X-Men Legacy in the time he’s had this book, re-defining his cast of characters through examination and growth, and in doing so, made it worth arguing that X-Men Legacy be considered the X-line’s flagship title, as opposed to Uncanny. Mr. Carey has earned my utmost admiration during this process, and I wish more writers were like him in their approach to creating these stories. Not only has he shown meticulous planning and attention to detail, but also a high degree of respect to the characters with whom he’s playing. The best and most obvious example of this is his work with Rogue. While he may have weakened this character in terms of her overall power set, he has alternately strengthened her as a person, grounded her, grown her up, and made her whole. Mike Carey has done what countless other X-writers have failed to do for so long: developed a character. And he’s done it right. As a huge Rogue fan, I can’t tell you what a relief it is to see her being used to her true potential. Goodbye, whiney, untouchable Rogue. Hello, strong, intelligent, hardass Rogue. This issue of Legacy continues in India, where young mutant Indra has come home to a comatose brother and a subsequent arranged marriage. Meanwhile, in the heart of the city, Rogue, Magneto, Anole, and Loa take on a Sentinel sent by the Children of the Vault, who have made their triumphant return. The group also takes in a new mutant girl, Luz, who has the power to bend light and create “light sculptures.” Little do the X-Men know, she is on the run from the Vault, and proceeds to stir up trouble amongst the group of mutants before the Children make their appearance known at the end of the issue in order to recapture her. 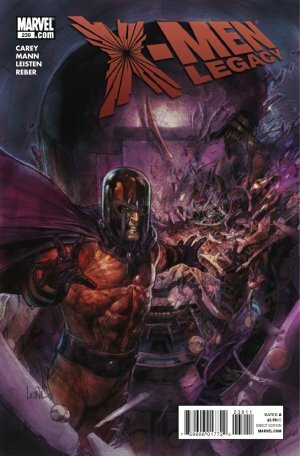 There’s also an absolutely hilarious, badass, and completely unexpected scene between Rogue and Magneto that I won’t spoil for you, because it’s worth checking out. So … go. Check out. And that’s just what’s happening on the surface. Below that, there is so, so much more. Carey is clearly continuing to build and plot with this storyline–wherever the story ends, we’ll continue to feel the effects of it long during the writer’s tenure, I’m sure. What can I say about Clay Mann? Something about his pencils echoes Olivier Coipel to me, and I like it. In fact, this guy might just be my artistic hero. I can’t remember the last time I actually opened up a comic and saw the human figure drawn proportionately and real. Rogue is full bodied and lovely. Magneto is robust in his civvies without appearing overly muscular and fake. The background sceneries and architecture are inviting, and everything’s easy on the eyes. Overall, I can’t imagine what this title might be like in the hands of someone else when it comes the script, and now the art is living up to the writing. Can’t say I’ve been this happy about an X-book for a long time. This entry was posted on 09/13/2010 by ravenhaired. It was filed under Awesomeness, Comic books, Reviews and was tagged with Clay Mann, Magneto, Marvel, Mike Carey, Rogue, X-Men.